Southern Fried Science year-in-review, Palau’s Giant, a new challenge for deep-sea mining, Porgs are Puffins, and more! Monday Morning Salvage: December 25, 2017. Happy Holidays from the Southern Fried Science Team! The Saipan Blog’s Angelo Villagomez put together a list of extraordinary Indigenous Pacific Conservationists to Follow on Twitter in 2018. Go. Follow them. Learn what’s really happening in Pacific Conservation. Do-it-yourself science is taking off. A growing movement seeks to make the tools of science available to everyone (including you). I love that The Economist now has a “Punk Science” heading. Palau now requires all tourists to sign an environmental pledge when they enter the country. All flights in now feature this delightful short film. Arlo Guthrie was right! Cool short video of bipedal “walking” in gastropods. Clamzo boys, Clamzo! Andrew compares the OpenCTD readout to a hand refractometer, because apparently he’s a hipster ecologist. Nearly four years ago, Kersey Sturdivant and I launched a bold, ambitious, and, frankly, naive crowdfunding initiative to build the first low-cost, open-source CTD, a core scientific instrument that measures salinity, temperature, and depth in a water column. It was a dream born from the frustration of declining science funding, the expense of scientific equipment, and the promise of the Maker movement. After thousands of hours spent learning the skills necessary to build these devices, hundreds of conversations with experts, collaborators, and potential users around the world, dozens of iterations (some transformed into full prototypes, others that exist solely as software), and one research cruise on Lake Superior to test the housing and depth and temperature probes, the OpenCTD has arrived. Kersey strikes a pose while deploying an OpenCTD in our local estuary. Over the last week, Kersey and I have been hard at work building a battery of CTDs while methodically documenting the construction process. You can watch the event unfurl on the #HackTheOcean hashtag. We now have three new CTDs ready to be distributed to collaborators at various institutions for more field tests and, in particular, to assess the precision of three different conductivity probes, all of which have been calibrated and validated here, in Virginia. Now, finally, after 4 years of challenges and opportunities, of redesigns, re-education, and re-development, it’s time for you to join our open-source community of Citizen Oceanographers and build your own OpenCTD! We’ve hosted the entire build guide, as well as the software, 3D printer files, support documentation, and raw data from our first research cruise in the Oceanography for Everyone GitHub repository, where you can also find guides and designs for the BeagleBox field computer and the Niskin3D 3D-printable Niskin bottle. 3D print files are also available on Thingiverse, if you’re more comfortable with that platform. We’ve also gone out of our way to make the build as simple as possible. You’ll need to learn basic programming and electronics, but the technical aspects of building your own CTD shouldn’t be a barrier to entry. Since launching, numerous people have asked us if we can build an OpenCTD for them. We are not really set up to be a manufacturer of CTDs, however, get in touch with either me ([email protected]) or Kersey ([email protected]) and we can talk about holding an OpenCTD training workshop with your institution or organization. The Niskin bottle, a seemingly simple tube designed to take water samples at discrete depths, is one of the most important tools of oceanography. Coupled with a CTD, an array of Niskin bottles fit into the rosette, a Voltron-esque amalgamation of everything an oceanographer needs to profile the ocean. Niskin bottles are neither cheap nor particularly easy to use. A commercial rosette requires a decent-sized winch to launch and recover, which means you need a vessel and a crew to deploy. For Rogue Ecologist and citizen scientists, getting a high-quality, discrete water sample is a perpetual challenge. With tools like the OpenROV and the soon-to-be-completed EcoDrone, I wanted a Niskin bottle that was light weight and capable of being mounted on both underwater robots and quadcopters with ease. After a few months of brainstorming and planning, I sat down this Friday and began building a 3D printable Niskin bottle that could be hand deployed or mounted on an OpenROV or drone. While this version is designed around a 1.25 inch acrylic tube, the trigger mechanism can be expanded to fit any size pipe. 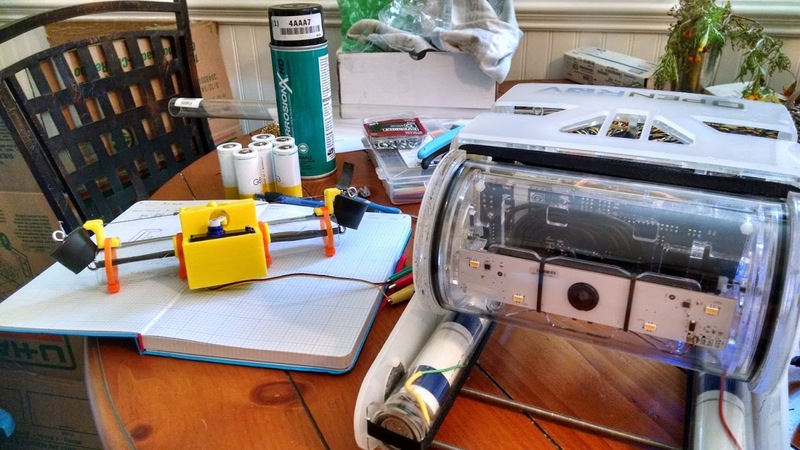 The trigger is driven by a waterproof servo developed by the good folks over at OpenROV. Everything else can either be purchased off-the-shelf or printed on you home 3D printer. Later this month, I’ll be taking my prototypes out on the RV Blue Heron for field testing in Lake Superior. I took a gamble when I bought the tractor mower. It was old, but well-cared for and ran well, but it was wearing out. Still, I couldn’t get a quarter as much machine for twice the price. Two months later, the mower deck cracked, rusted out from ten years of hard use. A replacement deck would run into the thousands of dollars, there were no options for just the shell, a cheaper, but still pricey option, and there were no off-brand decks to be found. Those three facts alone should tell you that we’re dealing with a John Deere, here. John Deere made headlines earlier this year when Wired ran an impressive (and rare) expose on farm tech: New High Tech Farm Equipment is a Nightmare for Farmer. Deere followed up with a rebuttal letter, declaring that farmers did, in fact, own their equipment, while simultaneously outlining all the ways in which they didn’t: John Deere: of course you “own” your tractor, but only if you agree to let us rip you off. Here’s the short version: Tractors are complicated and increasingly controlled by onboard computers. These computers use proprietary software, and that software is protected by the Digital Millennium Copyright Act (DMCA). The software itself is encrypted to prevent copying or modding. Those encryption are also protected by the DMCA. Breaking that encryption is illegal, regardless of the state of the software. If you have to decrypt the software to remove it, you’re breaking the law.